The scientific pitch notation system assigns a number to each octave. The numbers go up as the octaves go higher. For example, the note C4 is an octave higher than C3, which in turn is an octave higher than C2. For fun, you can remember that C4 is middle C on the piano, in addition to being a well-known explosive material. There’s a slight twist to scientific pitch notation: the octaves start with C! You’d think they’d start with A, because that’s the first letter, but you’d be mistaken. So the white-key notes in ascending pitch sequence from A0 (the lowest key on the piano) are as follows: A0, B0, C1, D1, E1, F1, G1, A1, B1, C2, D2, etc. Suppose that note X is the note corresponding to any white key on the keyboard from C4 up to C5. We’ll consider intervals from C4 up to X and their inversions which go from X up to C5. For example, X could be E4: the inversion of C4-to-E4 would be E4-to-C5. There’s nothing special about using C4 and C5; it works just the same for any octave Cs, but C4 is convenient what with it being in the middle of the piano and all. If the inversion of C4-to-X is X-to-C5, the inversion of a unison is an octave, and the inversion of an octave is a unison. How? Suppose X is C4: the inversion of C4-to-C4 (unison) is C4-to-C5 (octave). Now suppose X is C5: the inversion of C4-to-C5 (octave) is C5-to-C5 (unison). These intervals obey the same rule of nine that the others do; the numbers of the interval and its inversion add up to 9 (1 + 8 = 9). Recall that in a certain previous article we mentioned that intervals can have the same numeric indication but a different size in half steps. So, for example, all thirds are not equal in their half-step size. This begs the obvious question: Which intervals of the same number in the two columns of the table above contain the same amount of half steps? 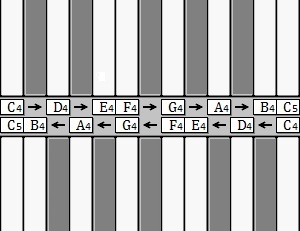 For example, does the third in the left-hand column (C4-to-E4) have the same amount of half steps as the third in the right-hand column (A4-to-C5)? To understand this, we’ll use a picture with a wacky stretched keyboard at the top, just the way you’d normally look at it, with the notes getting higher from left to right. Another wacky stretched keyboard will be placed below it upside-down, having been flipped around by 180 degrees. Notes on the bottom keyboard go the other way: they get higher from right to left. Arrows show the direction in which the notes get higher. The two keyboards are placed so that C4 on one keyboard lines up with C5 on the other. Recall that wacky stretched keyboards allot the same physical distance to each half step, so the picture will tell us how the half steps of intervals and inversions match up. Look at the picture below and consider the interval from C4-to-E4 on the top keyboard. Notice that E4 on the top keyboard lines up with the black key between G4 and A4 on the bottom keyboard (which is called A-flat-4). Because the bottom keyboard is backwards, this is showing us that the C4-to-E4 interval on the top lines up with A-flat-4-to-C5 on the bottom. Thus the size in half steps of C4-to-E4 equals that of A-flat-4-to-C5. Since A-flat-4 is not a white key, that means: C4-to-E4 in the left-hand column of the table does not have the same number of half steps as any of the intervals in the right-hand column! To make this even clearer, let’s consider at an interval that does line up with a white key. The F4 on the top keyboard lines up with G4 on the bottom. Therefore the distance C4-to-F4 equals the distance G4-to-C5, and so the number of half steps of an interval in the left-hand column (namely C4-to-F4) does equal that of some interval in the right-hand column (namely G4-to-C5). I put it to you that exactly four intervals in the left-hand column of the table are equal to intervals in the right-hand column. Why? Because in the picture, between C4 and C5, exactly four of the white keys on the top (including the two Cs) line up with white keys on the bottom. You can see how the white keys get misaligned. The pairs of white keys without black keys in-between occur in different places on the top and bottom keyboards. Moving from left to right, the bottom keyboard “skips” a black key first and the white keys on the top and bottom are “out of sync” until the top keyboard later “skips” a black key as well. Which numbers in the right-hand column match any of the numbers in the left-hand column? Only four: 0, 5, 7, and 12, corresponding to the C4, F4, G4, and C5 intervals and their inversions. I rest my case. So something is different about unisons, fourths, fifths, and octaves! There’s this set of intervals from C up to each of the white keys, and when you invert only these four intervals, your result is equal in half-step size to another interval in the set. All the others are unequal in half-step size: C4-to-D4 doesn’t equal B4-to-C5, C4-to-E4 doesn’t equal A4-to-C5, C4-to-A4 doesn’t equal E4-to-C5, and C4-to-B4 doesn’t equal D4-to-C5. Now that you know why unisons, fourths, fifths, and octaves in our white-key intervals that start or end with C are unique, you probably have this question in mind: What’s the significance of this? That will be a topic for another article. This entry was posted in Music theory. Bookmark the permalink.